Wow! What a challenge! I was absolutely thrilled when I saw it! I had never deboned a whole chicken before, but the thought of doing it did not scare me at all. In fact, I could not wait to try! I have always been fascinated by the butcher’s work. I think it has something to do with the fact that, when I was a child, my parents would take me to this old fashioned butchery in Piedmont to buy meat to last us all winter (stored in the freezer). The butcher had his own animals and that meat would be so much tastier and genuine than the one we could get in Milano. Anyhow, it would take a long time to get our order and I would stand on a chair and watch the butcher cut, slice, weigh, debone… it was just entertaining. 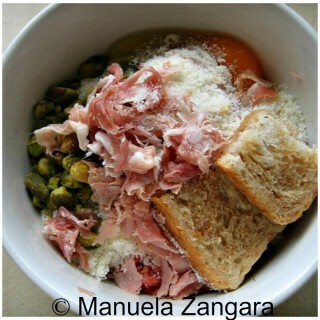 Not only… his wife would usually give me a few slices of their home-made salami or ham to munch on… yummmmm! I have some great memories of that place! 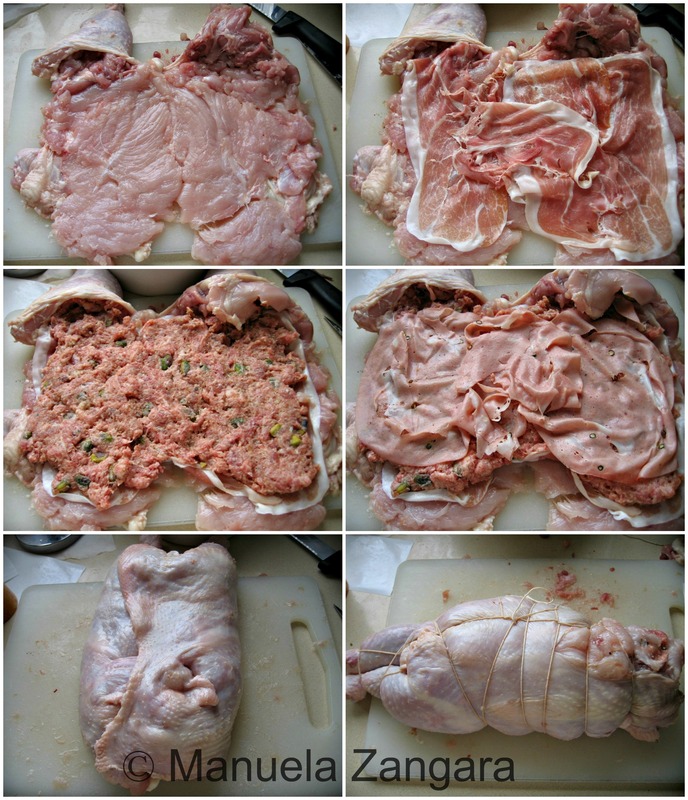 Once home, I would help my parents to divide, wrap and freeze all the meat we had bought… I think that’s why I have never been intimidated or grossed out by raw meat. This was however the very first time I deboned a full chicken by myself. The video that Lisa provided was amazingly helpful. All you have to do is follow the instructions and you’ll be able to do it too. I did not have any serious problem with the deboning… but my tying needs a little improvement! Hehehe I could not take many pictures of the deboning as my hands were a bit… dirty, but I will put up the video in the post, so do not worry! 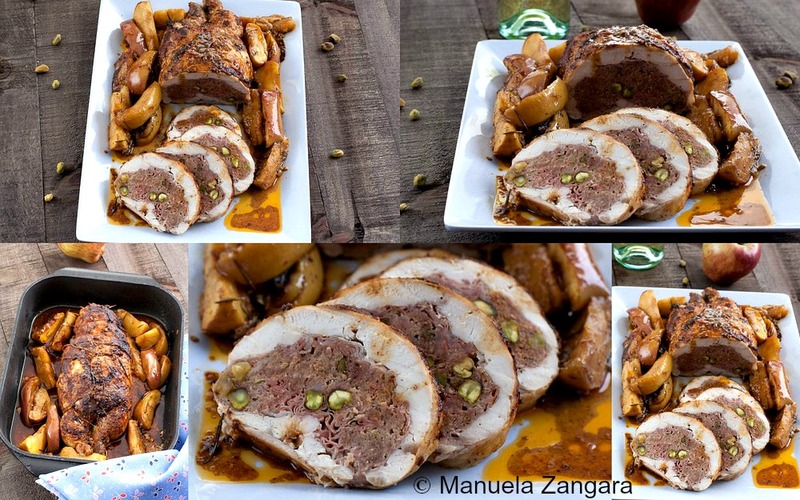 I filled my ballotine with a typical Italian filling made of mince, sausage, prosciutto, mortadella and pistachios. 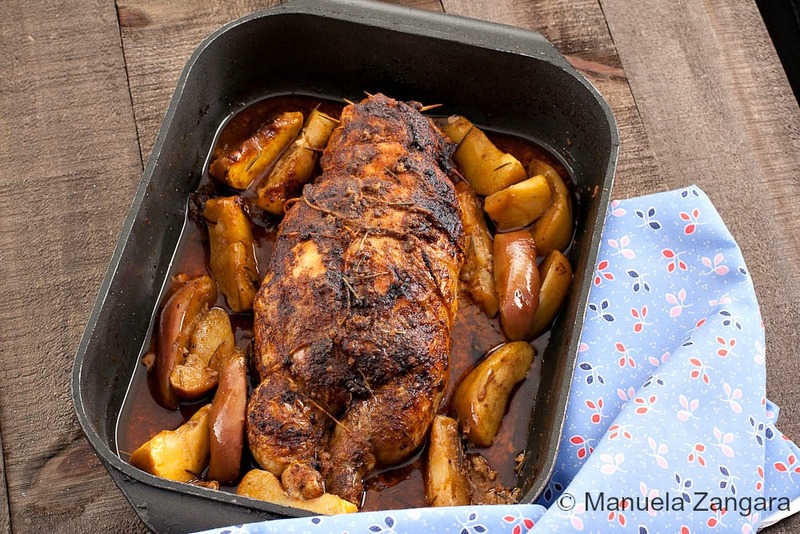 We usually fill our roasted capon with it and have it for Christmas (though the capon is usually not deboned). 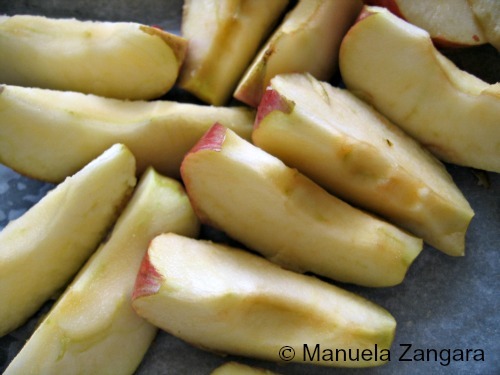 I made some roasted apples to serve with it and it was delicious. And the best part? It tasted even better the next day! I must say, slicing a whole chicken and eating it without worrying about bones, was a great experience! I hope you like it too! 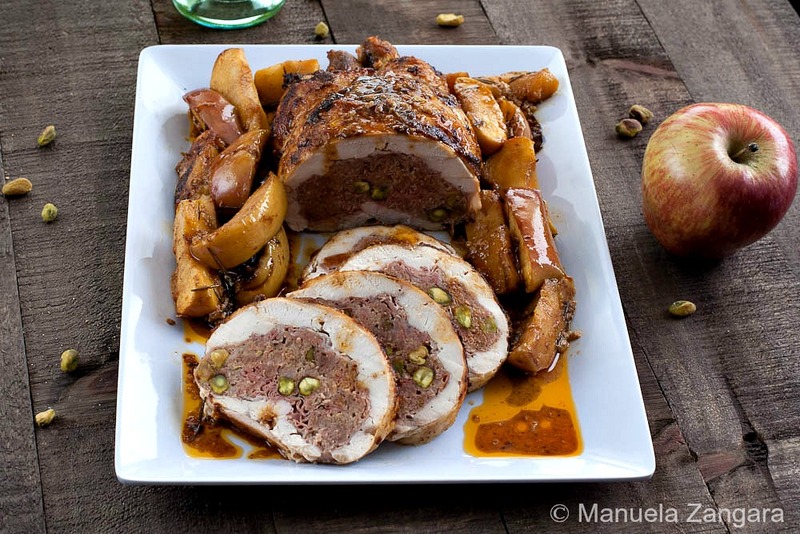 Chicken Ballotine filled with cold meats and pistachios... the Italian way! 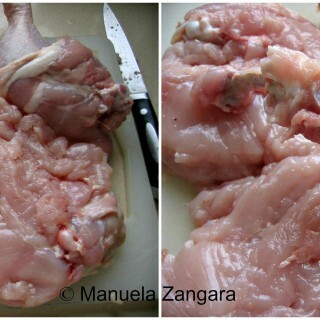 1 whole chicken 1.5 kg to 1.8 kg – 3.3 lbs. to 4 lbs. Soak the bread with Marsala and then mix it with all the other ingredients apart from the prosciutto and mortadella slices. 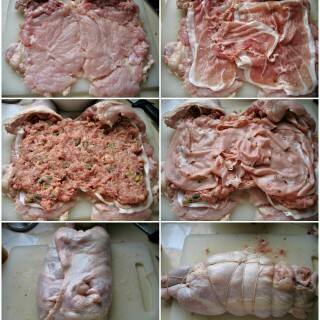 Keep the stuffing in the fridge while deboning the chicken. Debone the chicken following the instructions in this video. Gently flatten the chicken out with a meat mallet. Put the prosciutto slices on the open chicken. Spread the stuffing (make sure to push some inside the thighs!). Put the mortadella slices on the top. Close the chicken and tie it up with butcher’s twine (see the above video for instructions). Put the ballotine in an oven tray and rub it with the ground pepper, paprika and garlic powder. Put the garlic cloves, bay leaves, rosemary and sage in the tray. Roast in a preheated oven at 230°C – 445°F for the first 15 minutes, then add in the white wine, water and crumbled stock cube. Decrease the temperature to 200°C – 390°F and roast for 1 hour or until it reaches an internal temperature of 165°F – 74°C (or when the juices run clear when you pierce the chicken). 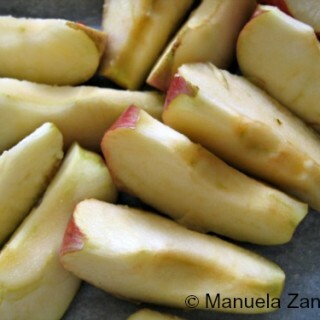 Add the sliced apples 15 to 20 minutes before the chicken is ready. 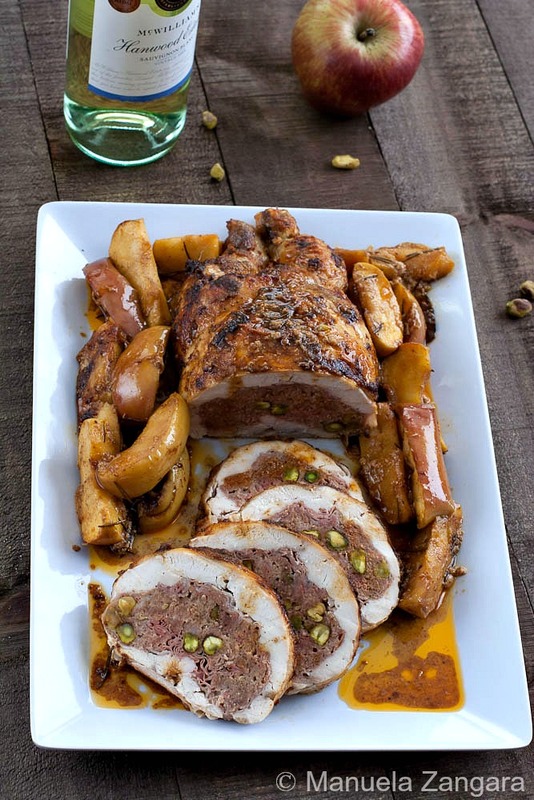 Let the ballotine rest for approximately 20 minutes covered loosely in foil before slicing and serving it with the apples and sauce. Manu dearHeart . . . have seen other results from the same challenge . . . . you surely have made a wonderfully neat and appetizing ‘job’ of the process and each to their own surprise stuffing 🙂 ! WOW your photography is stunning and the stuffing sounds superbly delicious. Bravo to you for your brilliant results. And I had very similar experiences as a child in Sydney Australia I really looked forward to this challenge. Excellent work. Cheers from Audax in Sydney Australia. I absolutely LOVE your filling, Italian style Manu. 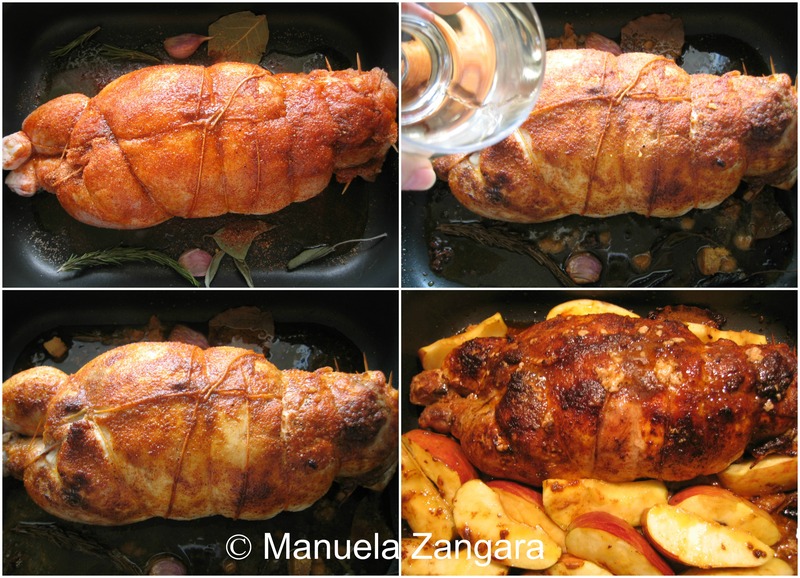 And the roasted apples are on my list for the next roast of Ballotine! A great job, as always! 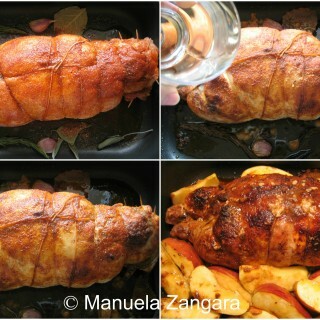 Manuela..I’m still blown away by your Ballotine. You deboned it so beautifully, just like Jacque, nary a tear. I’m so excited to try your traditional Italian stuffing..I’ve been dreaming about it since I saw it and am planning on making it for some guests late May. Thank you so much for taking part in my challenge, you took a five-star dish up antother five stars! You’re amazing! Manu you did a wonderful job on this challenge! The pictures, the filling , the end result ..simply breath taking my friend! I on the other hand, am completely intimidated by deboning a chicken! I love how your parents brought you up and taught you about great ingredients and how to work with them. That looks very good! I bet it tastes also luvly!